The pack ready for brunch. It’s for me, not you lot! Sunday mornings for Mrs. SF and I always start off with a long walk (usually in the park) with our dogs. As Mrs. SF also runs a dog sitting and walking operation, we often have more than our two in tow. builds up quite an appetite and we often fancy something to eat and drink (after or even mid walk). Pickings, in terms of dog friendly places (hence the “Pack” brunch post title), have in the past been somewhat slim. 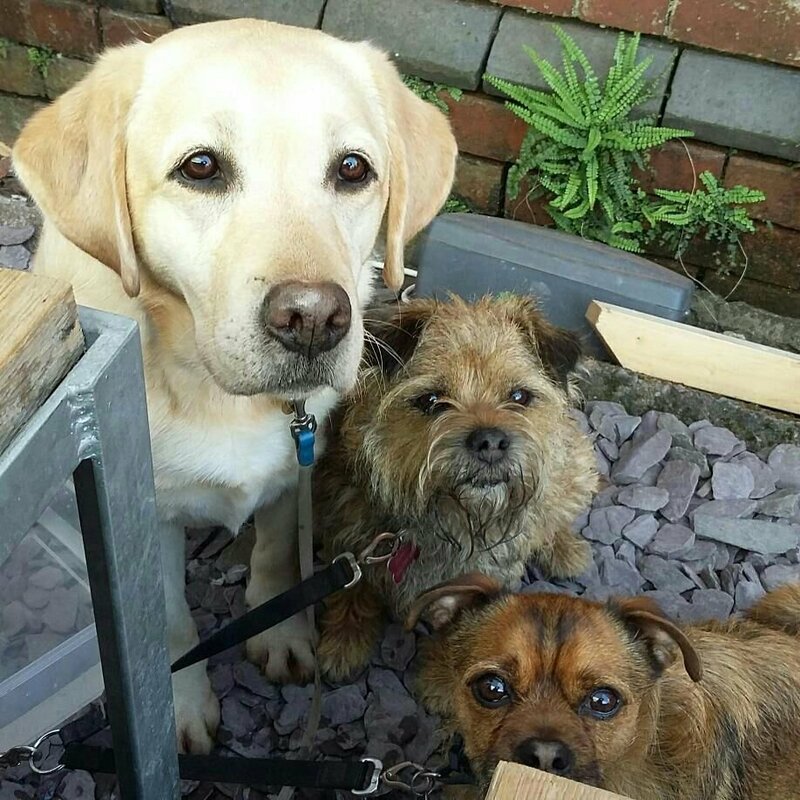 I find it perplexing that the new operators of the Secret Garden Cafe in Bute Park have made it very clear that dogs are not welcome, even in the outside sitting area. Barmy policy if you ask me, when Bute Park is full of people walking their dogs, come rain or shine – all of whom are potential customers (and it gets a bit of a slating on Tripadviser for this seemingly “cut your nose off to spite your face” policy). I am sure the people running the “2 mins down the path”, dog friendly, Summerhouse can’t believe their luck. Notwithstanding this oddity, we now have within a relatively easy detour off our standard “Sunday morning walk” route Ffandangos (yet to try – but reports are very good and it is dog friendly both inside and out) in Llandaff, Kin and Ilk in Pontcanna (dogs are allowed in the outside area only) and Dusty Knuckle in Canton all of whom do a mean breakfast/brunch. As I have reviewed their pizza and wider offering before, not much more to say on this. The place has been given a bit of a make over since I was last there and seems somewhat cosier and more enclosed than before. Still resolutely dog friendly, the 3 doggies (our 2 and 1 other) were presented with a large bowl of water and a bit of fuss (which they love). Very welcome after a long walk on a warm spring day. It is the kind of place you can happily wile away a Sunday morning filling your face and reading the papers. Plenty of games are on offer to entertain kids and adults alike. The Kerplunk on one of the tables took me back to my “pre-video games” childhood. 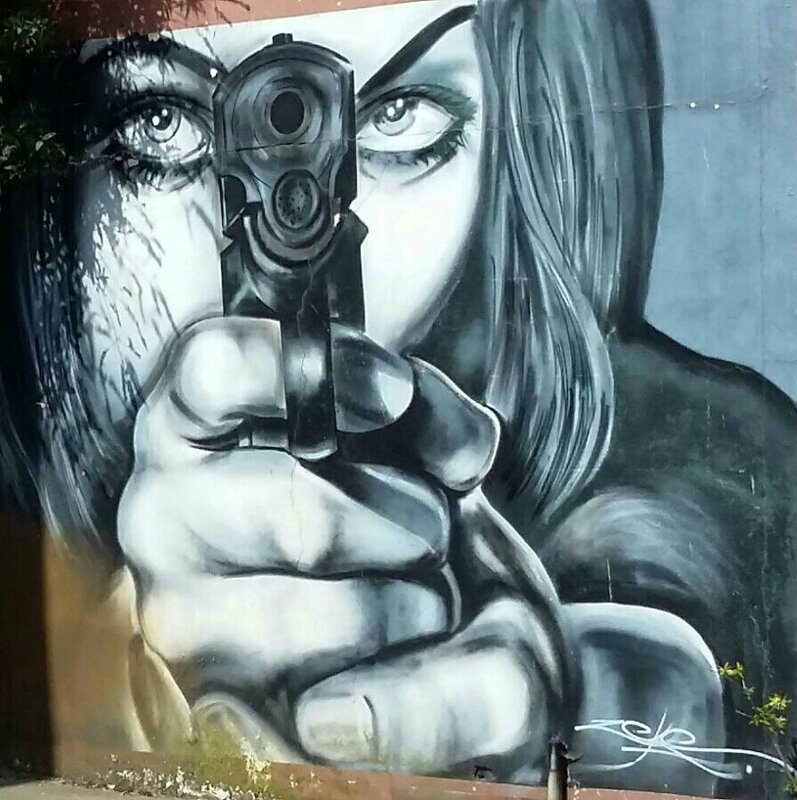 I also love some of the graffiti in the Printhaus. Thus is a great piece. 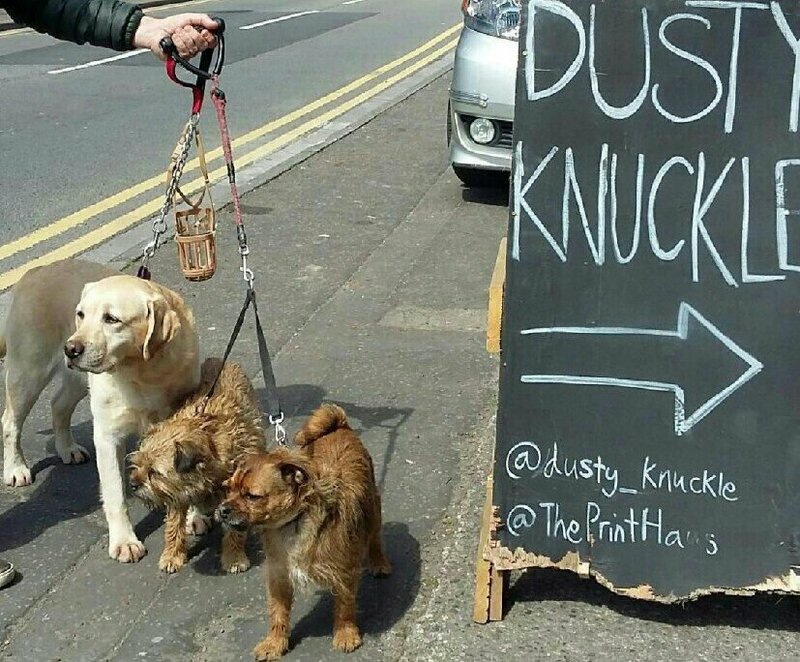 As with the pizzas, Dusty Knuckle’s mantra in terms of the food and drink they use for breakie/brunch is provenance, provenance, provenance. For instance, bacon etc. comes from that exemplary producer Charcutier Limited – absolutely love everything those people produce. The menu is a delight – presenting a ditherer like me with that pleasing, but thorny, dilemma of what to order when you want everything on it. Mrs. SF kicked off proceeding with an excellent almond croissant (£2.50 – forgot to take picture). Light and airy with a lovely butteriness, it had a pleasing crunch from the almonds and a nice level of sweetness. Having been torn between the duck egg and njuda on toast (£5.95), the intriguing mascaphone, anchovies, garlic and parsley (£4.50 ) number (a brave choice for breakfast) and the Full Dusty (£8.50 – what I would regard as a full English/Welsh breakfast), I eventually plumped for the latter and was very pleased with that choice when it arrived. A perfectly cooked egg (properly seasoned), good beans (not usually much of a baked bean fan, but enjoyed these with some of the brown sauce – see below – mixed in) and a really meaty sausage were accompanied by some lovely tomatoes on the vine (tasted of tomatoes which is a rare thing with tomatoes in the UK) and juicy mushrooms (field and button). The star of the show, however, was some stunningly good “black” bacon from Charcutier Limited, made from a recipe dating back to 1781 apparently. 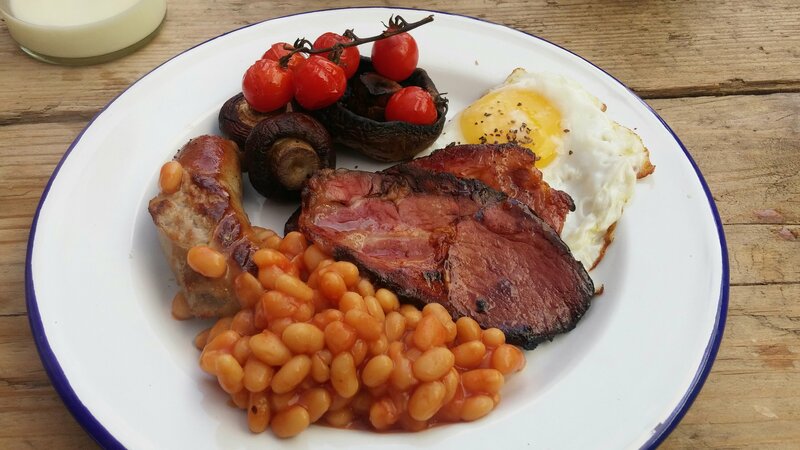 A lovely spicy, sweet cure (black treacle and lots of old school spices – like clove, nutmeg and cinnamon which were in effect gold dust back in 1781 – in there I think) and quality meat made for two fabulous rashers of bacon. So enamoured was I with what I got, I totally missed the absence of the advertised black pudding (only just realised looking at the photos of my breakfast and the menu – wouldn’t be surprised if Mr. SF gave it to the dogs when I wasn’t looking, a charge she strenuously denies I might add). No matter, what I had filled me up very nicely and I was more than happy. 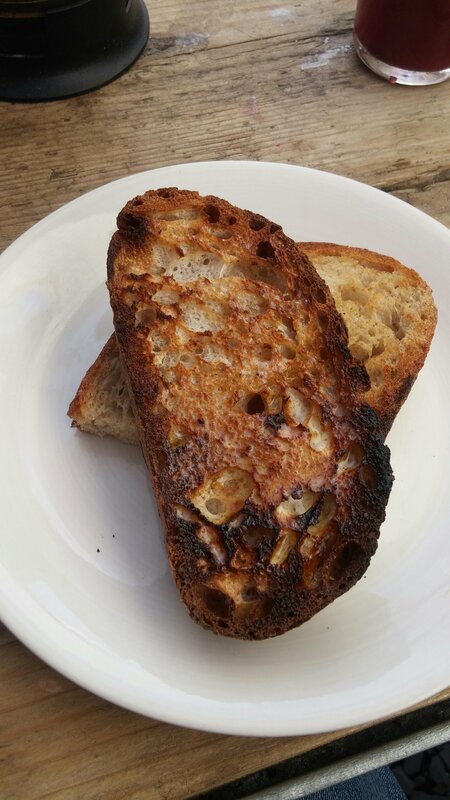 My Full Dusty was complimented nicely by two slices of quality sour dough (I think, I didn’t stipulate – with there being a choice of that, white, brown and NY rye ) toast, with lashing of butter. I put the toast to good use and loaded the slices up with the fried egg on one and the beans on the other. 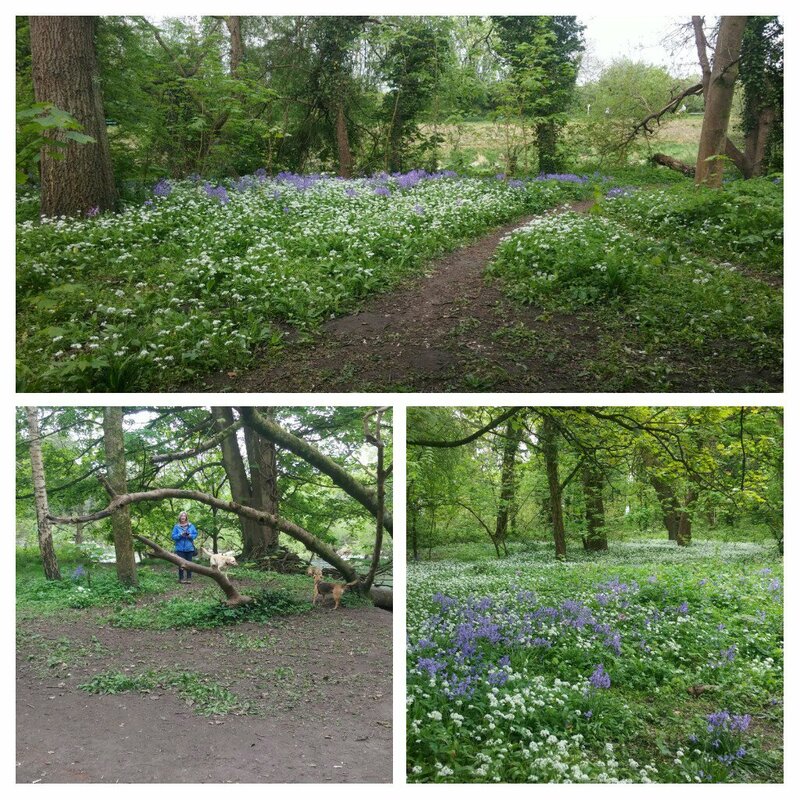 I was well and truly stuffed when I finished that lot (and needed a nap – we actually did a further couple of miles with the dogs). 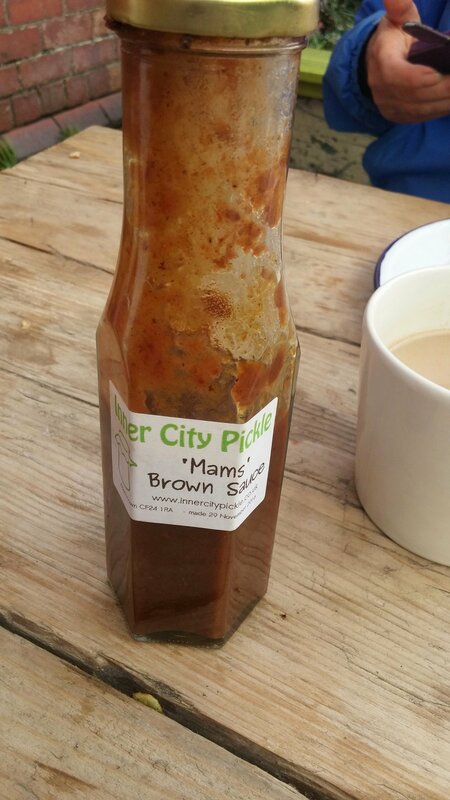 I added some absolutely killer Inner City Pickle ‘Mam’s’ brown sauce to my breakie (it really pepped up the beans). Lovely stuff and I definitely will be buying some from RMCA Market when I get the chance. Heinz ketchup was also on offer, but you would be mad to take that over ” Mam’s” brown sauce in my humble opinion. Mrs. SF had the scrambled eggs with streaky bacon and maple syrup on toast. 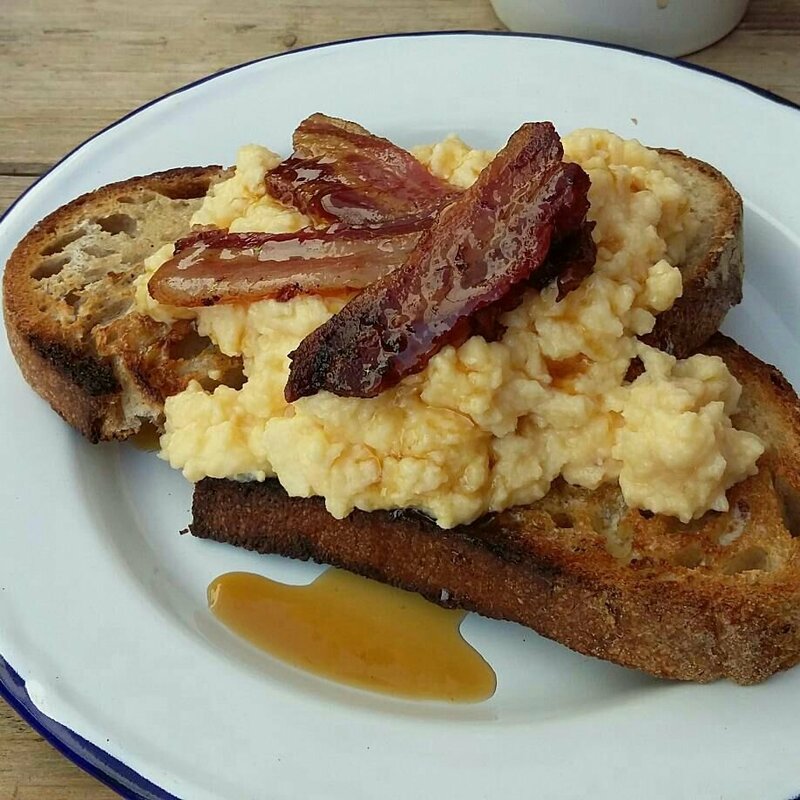 Beautifully crisp, jam-packed with flavour, bacon (again from Charcutier Ltd) smothered in maple syrup sat on some cooked just right scrambled eggs, which in turn sat on some lovely toast. Big portion which Mrs. SF thoroughly enjoyed. On the drinks front they have those breakie/brunch staples of tea and coffee and we went for a large cafetière of coffee (£6). Nice, if not perhaps as strong as I like my coffee (I do like my coffee very strong – we did let it stand for a reasonable amount of time rather than rushing with the plunger). 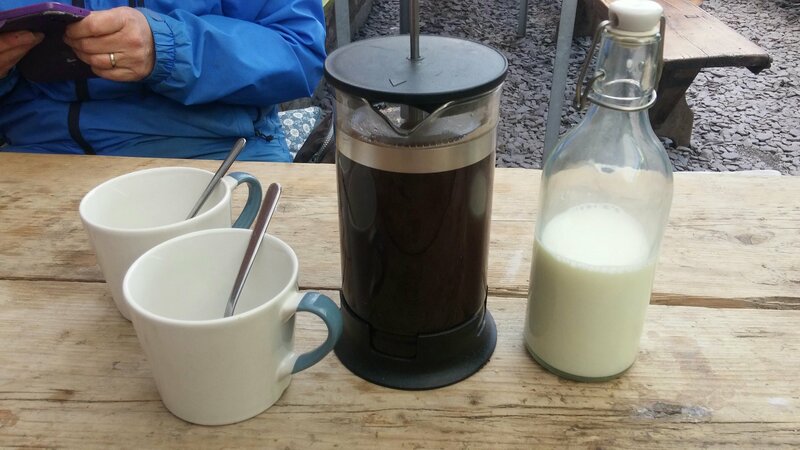 If you like your coffee milky (Mrs. SF does) be aware that the milk is cold – so it will impact on how hot your cup of coffee will be/remain. Heating the milk a touch could be an idea here. 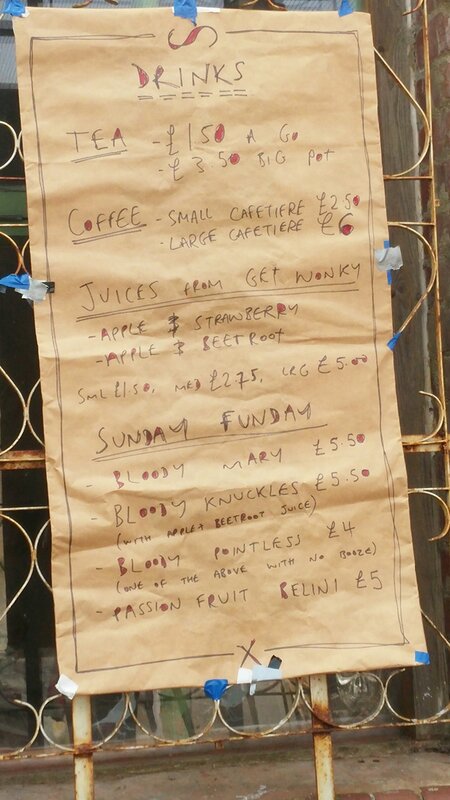 In addition to the teas and coffees, there are juices from Get Wonky (a local outfit who are very keen on sustainability) and a selection of boozy stuff, with Bloody Marys, their twist on this in the form of the Bloody Knuckle and a passion fruit bellini (I saw them cutting up passion fruits for these) – all £5. 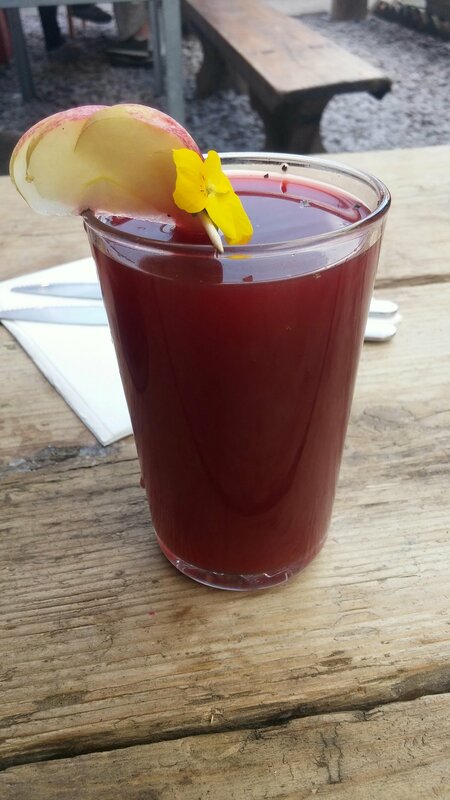 I am a big fan of a spicy Bloody Mary (also like to add a drop of fino into my mix), but here was intrigued by the Bloody Knuckle (a variant of a Bloody Mary, with the Get Wonky apple and beetroot juice in place of the usual tomato juice). This was absolutely lovely. Lip tinglingly spicy, with the apple and beetroot working perfectly as a foil for the booze. 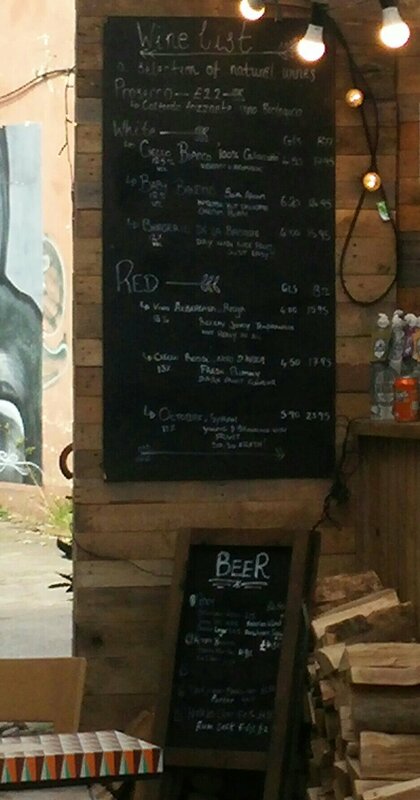 Not on the board re brunch, but I assume as the sun passes the yard-arm they are an option, there are some reasonably priced and interesting wines and beers on offer. I loved my breakie/brunch. Great food and drinks and a lovely relaxed vibe make this a super spot for a lazy Sunday morning/early afternoon feed and just fab for a post or mid dog walk refuel. We paid around £29 all in for the two of us. Not cheap and some people may blanch at paying that for breakfast. My view is it is well worth the money. Top quality ingredients don’t come cheap and if we happily pay at lunch or dinner these sort of prices (for two) without batting an eyelid, why should breakfast be any cheaper when it is this good and fills you up (as it did Mrs. SF and I) pretty much for the rest of the day. Will I go back? Absolutely, Dusty does it again. Website: click here – minimal info at time of writing on site. 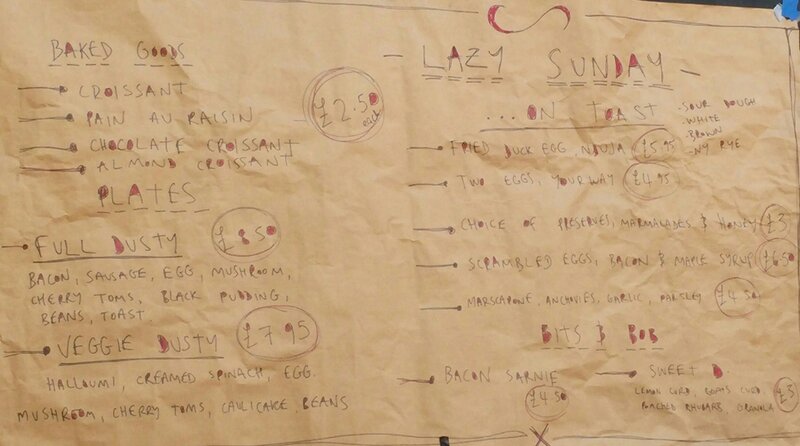 Breakie / Brunch opening hours : 9am – 3pm on Sunday (normal pizza menu thereafter). 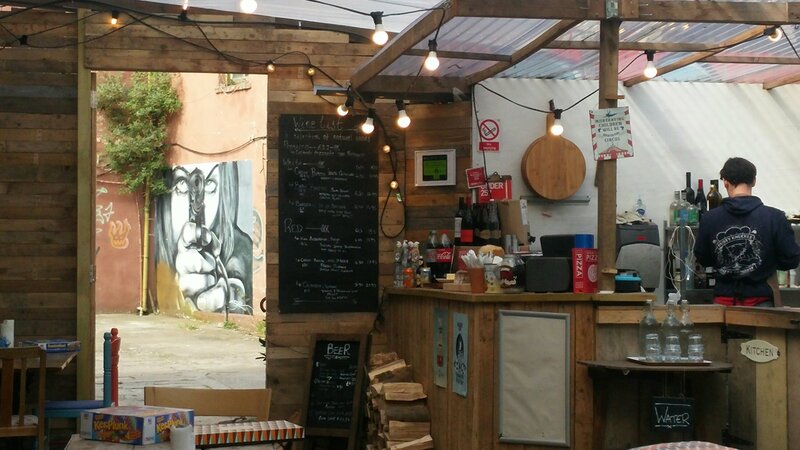 This entry was posted on Apr 30, 2017 by solicitingflavours in Alcoholic drink, Bacon, breakfast, Brunch, Canton, Cardiff, Cardiff restaurant, charcuturie, coffee, craft beer, dog friendly, Drink, Dusty Knuckle, Food, Food and wine products, maple syrup, Non alcoholic drink, pastry, restaurant review, review, Riverside Farmer's Market, Tea, Uncategorized, Wine, wine pairing.